Retired investors make different investment decisions than working investors. Starting with the influences of their background and upbringing combined with the necessities inherent in funding for retirement, investors who are no longer working have unique financial pressures which impact their investment decisions. The immediacy of many investment decisions made in retirement affects the types of products invested in. According to Spectrem research, it plays a role in the lack of participation among retired investors in socially responsible investing. Attitudes About Socially Responsible Investing demonstrates that retired investors understand the concept of socially responsible investing as well as or even better than working investors do, and they have greater respect for the concept than other investors. They just don’t want to participate in the process of investing for a greater purpose. Spectrem’s study shows a clear distinction among retirees between understanding socially responsible investing, recognizing its possible impact on the world, and actually investing according to socially responsible requirements. Advisors should recognize that retirees might react differently to a fund which promotes social responsibility but can provide a return on investment similar to other funds. Considering their knowledge and appreciation for the function of socially responsible investing, retirees might just find such products appealing. The study indicates the knowledge of retirees related to socially responsible investing in two ways. Asked if they know what socially responsible investing is, 71 percent of retired investors said “Yes”. That is well above the 60 percent of working investors who had the same response. 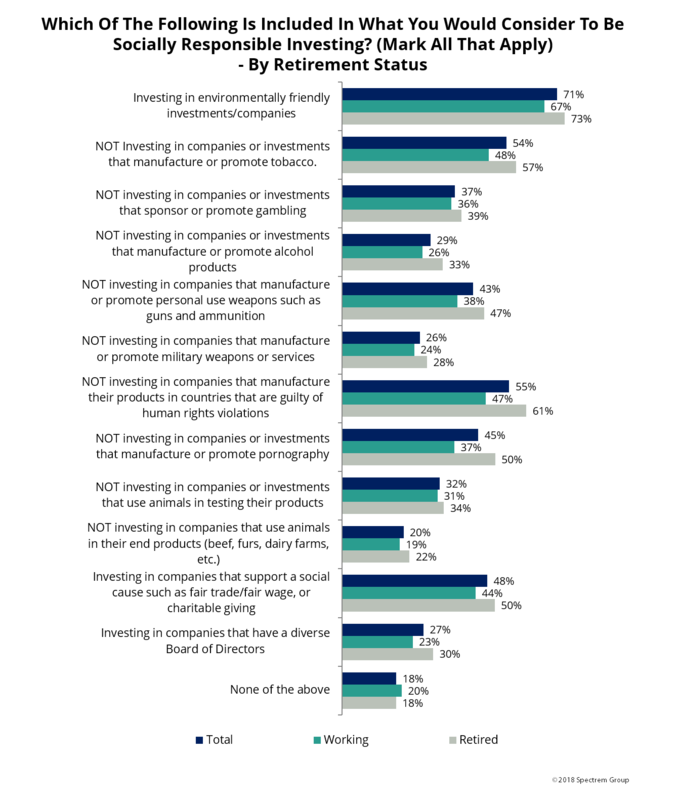 Retirees are also more likely to recognize the different ways to invest with an eye toward social responsibility, not just in investing in environmentally friendly companies (73 percent of retirees understand that concept) but also in choosing NOT to invest in companies which promote or manufacture items like tobacco, alcohol, guns or ammunition or military weapons. In each case, retirees are more likely to understand the concept of avoiding those types of companies. Retirees do understand the concept of not investing with companies which do business with countries which are well known for committing human rights violations. Sixty-one percent of retired investors said they understand that concept, well above the 47 percent of working investors who do. Furthermore, retirees are more likely to understand that socially responsible investing can create a better world for their offspring, and understand that socially responsible investing can send a message to companies that are perceived to have a poor reputation regarding social responsibility. That’s all well and good, but retirees are less likely to want additional information on socially responsible investing, and are more likely to admit they don’t think about making investment decisions based on social concerns. While they understand the concept and appreciate the possibilities socially responsible investing offers, they do not consider it when making their own investment decisions. The appeal of socially responsible investing is in the thinking that investing is a way to send a message. Can retirees be encouraged to use their investable assets for that purpose?